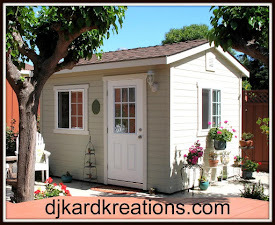 djkardkreations: Hello! Have a Beautiful Day! Hello! Have a Beautiful Day! I hope you've made it over the hump with no need for a tow truck this week. Some areas are getting lots of snow and ice, so mayhaps it was necessary. Be careful out there. We are fine, but we have been getting a staggering amount of rain, which the poor sod cannot handle, so hugs and prayers for all who have been flooded. I've made you a sunny card to brighten the doldrums! Doesn't that sound like a word I've made up? It snot. It is a colloquial expression for a state of inactivity or stagnation. A word derived from "a belt of calm and light baffling winds north of the equator between the northern and southern trade winds in the Atlantic and Pacific oceans." Baffling? I normally use that word to mean confuzzling and forget that it also means a light wind that frequently shifts from one point to another. Sort of like your mother's cousin's brother who never could hold down a job. Hmmm, granny's off the rails again. All that when all I meant to do was say, "Hello!" My cards today were made partially at the Lake House with borrowed products. I didn't succumb to purchasing those wonky stitched dies when they first appeared because I thought all these stitched dies were just getting out of control. But then I borrowed someone's at the Lake House and came home and ordered the set! They really are so wonkily wonderful. I'm sorry to say that the image and the sediment were also borrowed so I don't have the make and model information, but if you want to know, contact me and I will happily find out the information for you. I did use my Ziggies for the coloring. Edited to add (thanks, Bev): The flowers are from Studio Calico, the sediments are from WPlus9, and the wonky stitches are from My Favorite Things. Can You CASE It? : Colors. I love how the wonky font fits the wonky stitching. And that's all we have time for today, kids. I will leave you with this brilliant cartoon which I found on Facebook and which seems to be an appropopo way to finish this post considering the way in which it started! 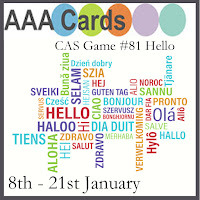 Labels: AAA Cards, Can You Case It? Beautiful borrowed image, just so perfectly placed and coloured. Thanks for playing at AAA Cards. Oh my word, is wonky stitching a Thing now? I'd better scrape the dust off my sewing machine, I was always good at wonky stitching. Just not soo good at the unwonky kind. Wonky or not, your cards are gorgeous as always. No snow here yet but it's forecast for the next few days. Two beautiful cards Darnell, I love the stamps and the gorgeous wonky frames (not seen these before). Such cheerful cards to brighten up these dark days, Darnell. Hope your year got off to a good start. DH is having a nasty cough, as always the finale of a bad cold, and he's passed on the bug to me, so now I'm feeling pretty miserable too. Otherwise, DH is doing well, his bowels and blood showed no traces of cancer back in October, but he does need to schedule another CT scan in 3 months' time to monitor a spot on his lungs. I'm with you on the wonky stitching die. I will propably buy it during my next shopping spree. I decided to remove it from my shopping cart last time. Darn. But it will have to wait, since my Black Friday shopping spree produced so much NBUS I need an extension to my craft room lol. But I do intend to do more colouring this year and send out more cards, so I'm hoping I will also put a lot of my NBUS to good use. 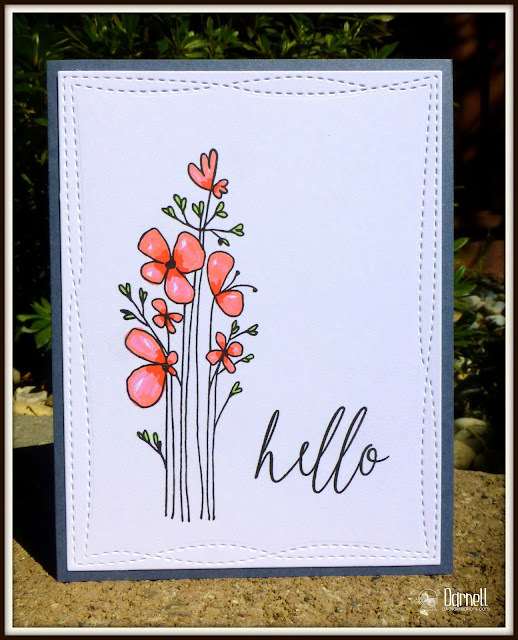 Hi there Darnell, what beautiful cards, lovely floral images and colours, I especially love the CAS design and the sentiment fonts are so attractive. Oh Darnell...you crack me up! Thanks for my morning chuckle! Your cards are just lovely! Yes, I too succumbed to the wonky stitched dies, thinking why in the world would I want those goofy looking crooked lines on my beautiful card, but in the end fell totally in love with them! Really like the stamp set you used too with the soft coloring...lovely, lovely cards!! Stay dry! Lots of rain here too the last few days, but at least it has taken away some of the snow and cleared the roads up a bit...well except for the pot holes now! Lovely Michigan weather!! Oh deary we will all be out now buying wonky frames so can u Divulge whose they are please. (I know yours are yours) ? Love colouring of your flowers. Hugs Mrs A.
Ps it is raining here at the moment which is due to change to sleet and then snow by 5pmish to night. The Doc is out in it getting emergency supplies in for the dicky birds. (I'm sure we keep the local pet store in business). Both cards are gorgeous ! Happy to hear you are getting rain, but I hope it tapers off to where you aren't being flooded. I well remember the days when it would rain for days and the mountains would start sliding away. And even when my dad had to siphon the pool so it wouldn't overflow. Fun times. I do hope you stay safe!! Your cards are SO pretty, Darnell. Sweet image, colored in wonderfully. Great sentiments, too. Great cartoon, too. Thanks for the giggle! Gorgeous summery card, Darnell. And thanks for the giggle. I need it this morning. Very cheerful cards you presented today Darnell. These are such happy cards. Your coloring is soft and pretty and I like the added white highlights. You may be using wonky things but the cards are sweet and springy. I'm glad you are okay from the rain. California is on the news constantly so your state is making news. We have rain but not like yours and very strong winds. The wind shredded my outdoor flag right off the post and I haven't seen it since. So, SO pretty...... lovely colors/coloring, the perfect sentiment and love those wonky stitches (HAD to have 'em too!). Fabulously CAS cards,I love the wonky stitched die and the lovely flower stamp and the way both sentiments look great with it. Firstly my friend a BIG THANK YOU for the lovely card you are so sweet to remember me I was very touched to receive it. What a fabulous card so beautifully crafted the flowers are impeccable coloured and love the die panel it frames the blooms perfectly. Never seen so much snow here in Greece some people even got their skis out and skied in the city centre. Hope the weather has improved for you we are hoping for rain to wash all of our snow away. Oh funny! LOVE these beauties, Darnell! Gotta use my Zigs again--just love every time I see them in action! Been wondering how you're doing with this wacky weather & glad to hear you're OK. We've actually had a little snow 3 different days after none last year, but hubby's daughter got 13 inches this last round & her Texas hubby is not at all happy with it! Guess it's kids from the south who think it's neat to have snow--hope he doesn't swoop them up & head for home--haha! Hi Darnell, Glad you are out of the doldrums. Also glad you haven't been flooded or had a lot of snow. Such pretty cards Darnell and I too love those wonky stitched dies :) ....... I hope you're coping with all the rain. Gosh shame on me just getting here for the fist time this year HAPPY 2017 to you! Awesome card - I do totally adore that font! Two GORGEOUS, GORGESOUS, GORGEOUS clean & simple beauties!!! Really loving the wonky stitched border - totally works with this image and PERFECT with the sentiment on the second card! GREAT colors too! Just finished printing the cartoon pic and am hanging one on the wall of my craft room AND on my bulletin board beside my desk at work!!! Just LOVE your wonky card from out of the doldrums!!! Had to quit laughing so I could actually type. Love the cartoon...sounds so much like my life right now. In any case, love the cards, especially the coloring on both of them. It's...well...perfect. Hope you and yours aren't going to start building that ark yet...I think, if the deluge continues, I'll start ours this weekend..
Haven't heard that word for a long time. Totally love this superb CAS/LIM card and also love the stitched border, first time I have seen this style. Have a good weekend, well it is nearly here. Two very pretty CAS cards, Darnell, your colouring is gorgeous! So sorry to hear you are getting too much rain, perhaps I could send a few dozen truckloads of snow down to you to enjoy! 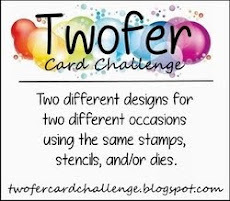 Love that beautiful flower card, so pretty and the second card--funny, funny! I have been resisting the stitched dies but you might just have sold me on them... once I have spent about £1,000 on Tim's new things that is....lol. Your card is so beautifully cheery, I love the gorgeous flowers, they look a bit Penny Black-ish to me. I think I'm having flashbacks... hot flashes .... fish sticks... or am I dreaming about your cards now? At any rate I'm loving it! Both of your cards are so gorgeous and I love the wonky dies. These cards certainly are a day brightener with those wonderful colors. So pretty! Love this image! Love reading your posts even more :) Yeah I read yours I don't just look at the pretty pictures. I love those sweet little flowers and the highlights!! Darling card Darnell! Perfectly lovely CAS card Darnell. Love the springy look. Such a sweet and beautiful Hello card Darnell. Silly cartoon too...Hugs..
Oh, love those blooms--such great coloring! I'm one of the few people who hasn't ordered the wonky rectangles yet but the more I see them, the more tempted I am! Hope you have a break from the rains. We are expecting ice, that evil winter moisture, on Saturday! The flower stamp is so pretty. 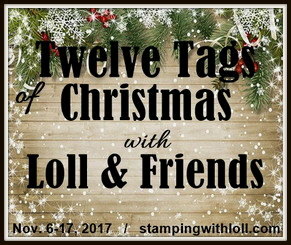 I love stamps that don't require too much coloring, but look great all the same. I've thought about buying those wonky stitched rectangles, but I haven't taken the plunge yet. They do put a nice finish on a card front. Just love these Darnell, the clean look is awesome and I love the dies! Going to escape the UK weather for a while...hope it's better where we're going! Could do with sunny today as we have a light dusting of .... SNOW! Anyhooooooo... Those flowers are from Studio Calico. Some of the prettiest little bouquets out there in my opinion. Pretty sure the sentiments are from either my, or Anita's stash, too, and are WPlus9, in case your multitudinous readers wanted to know. I love that wonky die. The delicate coloring looks great. Isn't it great to get together with friends and share craft items? Beautiful card - that coral color is quite pretty and I really like the wonky stitching! Two gorgeous cards Darnell ! I also love this stitched die and your coloring is beautiful! Love those spring colors when outside it is so cold ! I hope you're staying dry and safe from all the elements and risks you are facing right now...California is a gorgeous state, but you sure do have your worries...Be well, my friend!!! I love these pretty, cheerful flowers! They remind me of the maker of the card! Ha! I really want these wonky stitched dies every time I see someone use them but hesitate to put them on my wish list because as it is I usually forget to use my straight stitched dies! They are perfect for your beautiful CAS cards! Darnell, ya those wonky stitched dies are fun. I love using them. They really add a lot to a card with out the bulk. 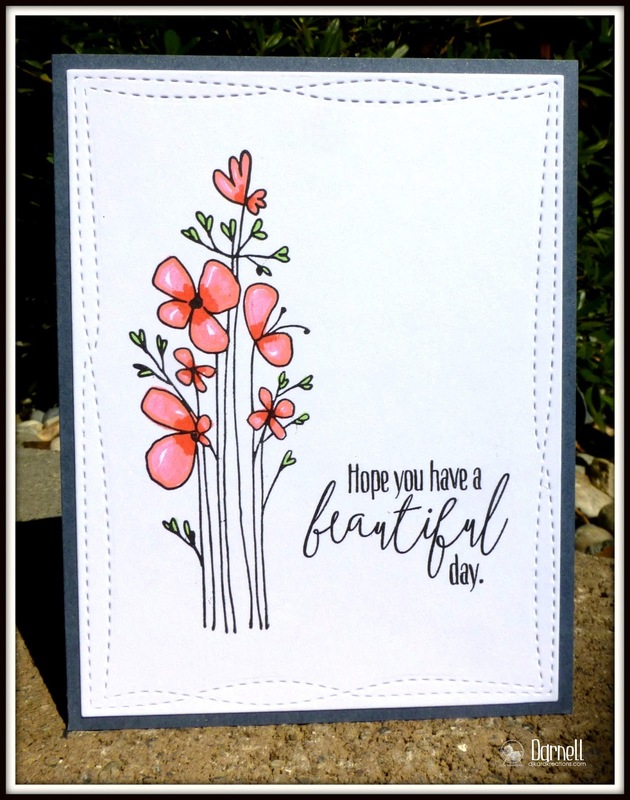 Both of your cards are fabulous, I love the flower color and they way it looks so bright and happy with the card base color. Super duper cards. Hi Darnell.....Great card. Since I always enjoy playing in YOUR challenges, I thought I'd stop by and invite you to play along in mine. I host Word Art Wednesday, and I would LOVE to have you play along. We offer awesome prizes, and have lots of fun. I hope you will join us. Sending hugs and hoping you get some respite from that rain ... Don't send any here though! The posies are lovely and the sentiment fonts are just perfect! Super pretty and cas, love the wonky stitch die. Broke down and ordered it! And oh, that cartoon... simply true, darn it! I love your coloring with that little glint of sunlight on the petals, Darnell. I resisted the wonky stitches for a while too but got them and now am thinking the wonky ovals. They do add something to a simple card. Those different products work beautifully together and I love the pinks you used on your flowers. So pretty! I'm still struggling with my Zigs - I can never get them to look this good! PS ... mithering ... have you come across that word before?? That was me, holding out against those dies because they were a phase, right! And now I really neeeed them and have justified by telling myself that the workshopeers don't like stabbing their card fronts a zillion times to get the effect. They don't, for sure, but because they don't, I'm getting the dies for the greater good, huh?! I know you're still following this. I had to go back and re read your post because the card at the bottom distracted me! As always, stunning cards and great colouring (I've started dabbling a bit myself). Love your Spice of Life cartoon too. Hilarious! Very pretty CAS card! Love the frame of wonky stitches which highlight those gorgeous blooms beautifully! Another hilarious post topped of by that fabulous cartoon! Yep, I can certainly relate! Fabulous cards Darnell, as always! 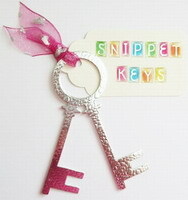 Thank you for your lovely comment on the Sunday Snippets post today. Mwah! tee hee hee, could be me when I tell a story! In love with that first simple "hello". What a sweet image of flowers, just the right mix of funky and sweet (but then Studio Calico is good at that). Love your coloring. I am the proud owner of the similar card as your second. :-) It's simply beautiful. Thank you. Two super cute designs Darnell. Lots of snow and ice but rain is on the way. Love both these cards, Darnell!!!! Love the pretty flowers, love the fonts and love the wonky stitching lines!!!!! Two lovely CAS cards!!! !